Figure 3.21 shows the signal flow graph for the implementation of our example filter using parallel second-order sections (with one first-order section since the number of poles is odd). 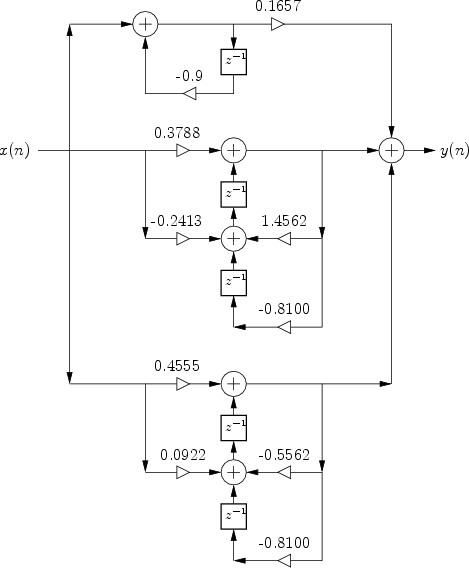 This is the same filter as that shown in Fig.3.1 with , , , and . The second-order sections are special cases of the ``biquad'' filter section, which is often implemented in software (and chip) libraries. Any digital filter can be implemented as a sum of parallel biquads by finding its transfer function and computing the partial fraction expansion. 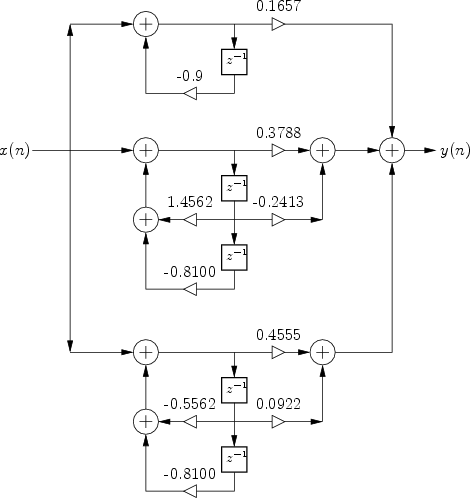 Figure 3.21: Signal flow graph for the re-implementation of the example filter as a parallel bank of real first- and second-order digital filter sections. Figure: Same as Fig.3.21 except using transposed direct-form-II biquad sections in place of direct-form-II biquad sections. The two second-order biquad sections in Fig.3.21 are in so-called ``Direct-Form II'' (DF-II) form. In Chapter 9, a total of four direct-form filter implementations will be discussed, along with some other commonly used implementation structures. In particular, it is explained there why Transposed Direct-Form II (TDF-II) is usually a better choice of implementation structure for IIR filters when numerical dynamic range is limited (as it is in fixed-point ``DSP chips''). Figure 3.22 shows how our example looks using TDF-II biquads in place of the DF-II biquads of Fig.3.21.